Awarding Bonus are generally a positive strategy and can provide real motivation to Workers, especially those whom you intend to re-hire and for long-term jobs. For one-time requests, paying bonuses for a job well done is a great way to show them your appreciation for delivering a good work. Previously just available under the Regular Platform (for Basic and Hiregroup jobs), we just successfully added Bonus Feature under TTV. Now, tasks under TTV may now be eligible to receive bonus! Similar to the Regular Platform, bonus is to be awarded upon task rating. A bonus between 10% and 200% of the task value may be awarded. The default bonus is set at the task value. Note that awarding of bonus to Workers is Optional. 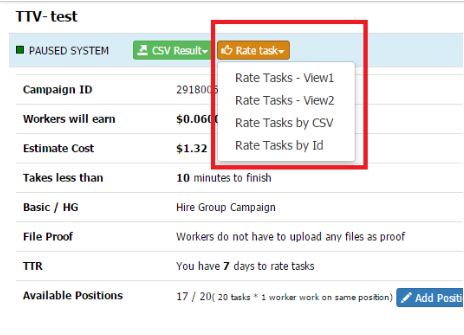 If you wish to use the Bonus Feature, simply tick the box for Bonus below the Task Rating page. Since we have 4 different methods for rating under TTV, bonus process will also vary, but all at very straightforward manner. 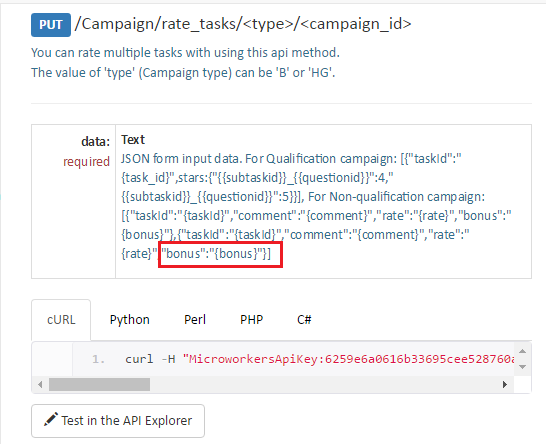 Here, you can provide “bonus” value as JSON format for Non-qualification campaign task rating. ***Bonus field is not supported for Qualification campaign task. Here, you can “bonus” as field. Bonus field is optional and applicable only when Rating is OK.
Workers are highly motivated with bonus. 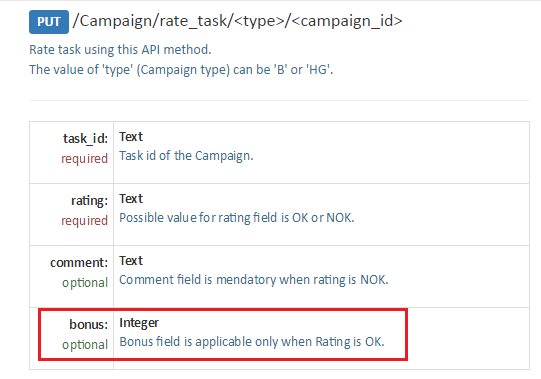 In your template/campaign instructions, the best way to motivate users to participate in your campaign is to give clear instructions on how bonus can be attained.